Keeping up with that growing pile of mail and paperwork would be so much easier if you didn’t get so much CRAP sent to you all the time, right? You can also go to www.OptOutPreScreen.com, which can enable you to remove your name from lists that mortgage, credit card and insurance companies use to mail you offers and solicitations. It’s a centralized website run by the four major credit bureaus in the United States: Equifax, Experian, Innovis and TransUnion. You can opt out of receiving unsolicited mail for five years or opt out of receiving it permanently. 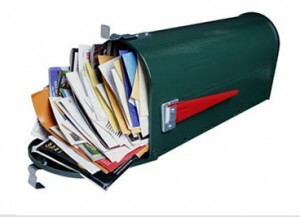 With fewer pieces of mail cluttering up your entry-way, have an easier time staying on top of your paperwork. Open mail right when you receive it. Keep a recycle bin or shredder within reach to immediately get rid of non-essentials. Put all of your “action” items, like bills that need paying, in one place (with your checkbook, for instance, or near your laptop). This entry was posted on Tuesday, February 21st, 2012 at 12:29 PM and is filed under Organization. You can follow any responses to this entry through the RSS 2.0 feed. You can leave a response, or trackback from your own site.